At The Smokey Carter, we are committed to maintaining the trust and confidence of our visitors to our website. Our main aim is to share our love for BBQ and bring you award winning products to help bring flavour to cooking both indoors and out. When visitors leave comments on the site via the blog section or reviewing our products we collect the data shown in the comments form, and also the visitor’s IP address and browser user agent string to help spam detection. To be fair the majority of comments we had were all from spambots so we have deactivated the majority of commenting on the site. We offer the option to contact us on the website via a contact form. Your personal data (Name & Email Address) is simply used to send a response to any contact we receive through the website. This data is not stored for future use. We offer the option to email us directly or call us if you would prefer. Articles on this site may include embedded content and external links (e.g. videos, images, articles, etc.). Embedded content from other websites behaves in the exact same way as if the visitor has visited the other website. When someone visits www.thesmokeycarter.com we use a third party service, Google Analytics, to collect standard information and details of visitor behaviour patterns. We do this to find out things such as the number of visitors to the various parts of the site. This information is only processed in a way which does not identify anyone. We do not make, and do not allow Google to make, any attempt to find out the identities of those visiting our website. We use a third-party provider, MailChimp, to deliver occasional product updates or newsletters. We gather statistics around email opening and clicks using industry standard technologies to help us monitor and improve our e-newsletter. For more information, please see MailChimp’s privacy notice. 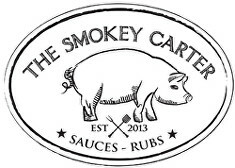 You can unsubscribe to general mailings at any time of the day or night by clicking the unsubscribe link at the bottom of any of our emails or by emailing info@thesmokeycarter.com. When you make a purchase through our website your name, address data, email and contact number will be emailed to ourselves via Woo Commerce to process your order. Please be assured that we do not share your personal details with any other company without your consent.